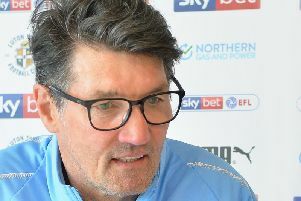 Luton chief Mick Harford felt his side should have had a penalty during their 1-1 draw against Coventry City at Kenilworth Road yesterday. With just 15 minutes to go, striker Danny Hylton went over a challenge from defender Dujon Sterling in what looked like a clear foul, only for referee Ross Joyce to wave away the hosts’ protests. Hatters also appealed for a handball inside the area in a separate incident, but they could consider themselves fortunate not to concede a spotkick in the first half when keeper James Shea caught visiting forward Amadou Bakayoko, with a goal kick awarded. Harford said: “I have seen the three of them, I’m going to be biased, I think James got the ball, and the lad's dived over. “I think the handball is definitely not a penalty, but I think Danny Hylton when he’s gone down and Sterling has come across him, looks like a penalty to me. “It’s a tough job for the referees, a tough decision, it’s a 50/50, do I give it? Don’t I give it? Meanwhile, midfielder Alan McCormack also felt that Town should have had the chance from 12 yards, as he added: "I thought it was a pen at the time and then we’ve seen it back on TV and I think it’s even more a penalty. "It’s a difficult one as Danny has actually gone through his legs to get it and the ref might think that he’d have got there before him and he was the one that got the ball. "Sometimes they get given, sometimes they don’t, it just depends on who you’ve got on that day. "You can’t change the past, can’t do anything about it, so we've just got to move on."